The global specialty zeolites market is foretold to face tremendous competition among the established industry players. The market is prognosticated to be an extensive one with a plethora of enterprises of diverse sizes vying for market share. Some of the key players according to a report authored by Transparency Market Research (TMR) are companies such as Tosoh Corporation, Zeolyst International, Arkema Group, Clariant, and BASF SE. The market participants are expected to capture the bountiful opportunities provided by the burgeoning need for infrastructure. The enterprises are prognosticated to keep themselves abreast of technological advancements in the field, and offer consumers better and improved products. The TMR report predicts that the worldwide specialty zeolites will reach US$53.4 mn in terms of market revenue, by 2024. Between the forecast duration of 2016 to 2024, the market is foretold to exhibit a steady CAGR of 3.2%, while the market was evaluated to stand at US41.3 mn in 2016. Geographically, Asia is likely to emerge as the fastest growing region in the global market over the forecast period, on account of the rising urbanization and government initiatives to improve infrastructure. 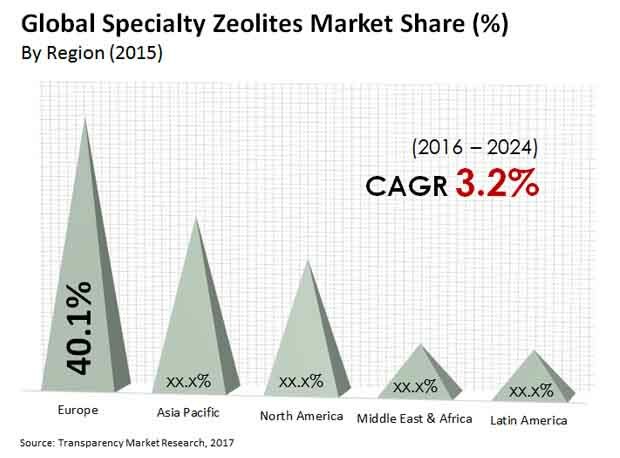 Based on end use, the worldwide specialty zeolites market was dominated by the segment of paints and coatings in 2015, trailed by the construction materials and plastics segment. The coating and paints business has seen a surge in the utilization of specialized zeolites as of late, because of the usage of stringent government controls committed to taking out unpredictable mixes in paints and coatings. Specialty zeolites can be utilized to make lower density blocks for ornamental and construction purposes. The usage of energy-efficient materials in construction has witnessed growth in the recent years. These specialty zeolites are set to offer considerable chances of growth and development of new development materials. Moreover, they are utilized in developing efficient and low density concrete. Geographically, Europe is prognosticated to hold the highest market share revenue, owing to its dominance over the previous years. Asia Pacific is expected to witness accelerated growth in the market. The region owes its increment to the considerable advances in infrastructure in the burgeoning economies of China and India. The international specialty zeolites market is prognosticated to witness high potential of opportunities due to rising activities of infrastructure development and commercial construction developing regions. The surge in construction over various parts of the world over is contributing towards business development, exceptionally in emerging economies. The demand of specialty zeolites worldwide will uplift due to infrastructural advances alongside consent for Foreign Direct Investment (FDI) in the construction industry, which will emphatically support the product demand over non-residential as well as residential projects by virtue of efficient government regulations, policies, duties and taxes levied. The significant application of the specialty zeolites market revenue are coatings and paints, construction materials and personal grooming industry. It is utilized to make development materials that fulfill prerequisites of green structures and energy efficient buildings. Moreover, specialty zeolites are utilized as a part of efficient and light-weight concrete utilized in construction. The rising number of government activities towards initiating green infrastructure is expected to further aid the market, in this way boosting the specialty zeolites market advance by 2024.